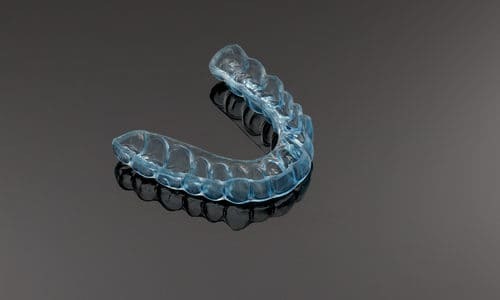 Dental night guards are usually recommended for patients who suffer from nighttime tooth grinding, also known as bruxism. According to the American Dental Association, bruxism affects around 10-15% Americans, so it’s a pretty common problem. While night guards are typically the treatment of choice for bruxism patients, our dental office in Evansville would like to explain why, how they help, and options you may have. Why is a Night Guard Used to Treat Bruxism? Many people who grind their teeth do so during sleep when they are unaware of the problem. And since they’re unaware, they can’t do anything consciously to help correct it. This is when a night guard can help. Night guards are appliances that are fitted individually to each patient and designed to wear while sleeping. They help keep the patient from grinding their teeth together and limits jaw movement. If bruxism is left untreated, the chance of chipped, cracked, or broken teeth, and problems with TMJ/TMD are increased. There are two types of night guards that may first appear very similar, but are actually quite different. Night guards you can buy at any drugstore are usually cheaper and follow the boil-and-bite method of molding. While they can work to stop tooth grinding, they’re not always the best choice. Custom-made night guards created by a dentist are usually the better option. These professionally crafted night guards use precise molds of your teeth for a tight, proper, comfortable fit. Your dentist will also look at your jaw positioning during the fitting process to ensure your jaw is aligned properly. This may help avoid additional problems with your TMJ (temporomandibular joint) later on. Custom night guards can also last up to 10 years as opposed to the over-the-counter night guards which may only last a few months before you need a new one. Night guards are the most commonly recommended treatment method to combat tooth grinding, but just because it’s the most common doesn’t mean it’s the only option. Depending on the case, treatments may include orthodontics, stress reduction exercises, limiting caffeine intake, or considering an alternative medication that may include a stimulant. Your dentist in Evansville may suspect bruxism before you do, but there are signs you should be aware of. Bruxism can be treated following a proper diagnosis from a dentist. There’s no need for you to live with pain or at risk for tooth damage and TMJ problems in the future. If you suspect you may be grinding your teeth at night, we encourage you to give our Evansville dental office a call to schedule an appointment. We’ll evaluate your individual needs and recommend the best treatment option for you.